Recently, I got together with a few girlfriends to talk about our skin. NOT THE SKIN ON OUR FACES. THE SKIN ON OUR BODIES. We were all pretty freaked out about how dry, thin, weak and easily bruised — especially arms and legs — our skin had become after hitting 50. Sure, the drop in estrogen as we went through menopause had a lot to do with it. But there are things we do–and don’t do–every day that can have a huge impact on the health and beauty of our skin. It seems we’re always thinking about the skin on our faces, and spending money on products that will keep away the wrinkles! But, our body skin needs our tender loving care just as much. I’m on a mission to get women to “think body” when they “think skin,” especially arms and legs which bruise easily. drinking too much coffee or alcohol, which can dehydrate? yo-yo dieting which makes skin sag? not exfoliating to help your skin renew itself? taking showers that are too long and too hot? not keeping skin from the burning rays of the sun? not eating a diet rich in antioxidants to make skin stronger? If you answered yes to most of them, your skin is probably aging prematurely. But, there are steps you can take right now to stop the trend. Read on . . . These two over-the-counter products have helped my skin look, feel and be better than ever. Sure, I still wear my sunscreen every day, rain or shine. But now that I’m older, I want to give my skin all the help it deserves. Try them–don’t forget to get the money-saving coupons, below–and tell me if they’re helping you, too. 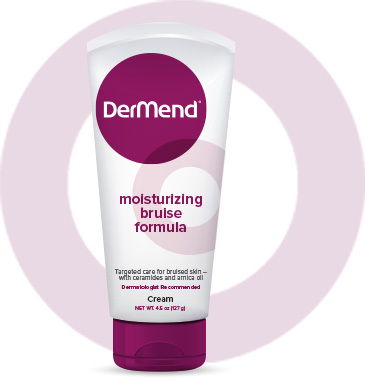 DEFEND YOUR BODY FROM THE OUTSIDE: Apply DerMend Moisturizing Bruise Formula to arms and legs twice a day to help build your natural protective barrier, make skin stronger, and more supple. Its proven ingredients—like retinol, alpha hydroxy acid and ceramides—work together to create a protective barrier to retain moisture and help fight bruising that often comes with thinning skin. GET YOUR MONEY-SAVING COUPON RIGHT HERE! DEFEND YOUR BODY FROM THE INSIDE: Take Heliocare every day to protect your skin from the inside. The powerful antioxidant formula in each capsule is naturally derived from the extract of Polypodium leucotomos (PLE), a fern native to Central and South America that has been used for centuries as a remedy for skin related conditions. It delivers antioxidants that start helping protect the skin from the first day you take it. GET YOUR MONEY-SAVING COUPON RIGHT HERE! And bring them to your local Walgreen’s, Walmart or CVS store! But first, take a look at the chat I had with my girlfriends . . .
Until next time, remember this . . . we can’t control getting older . . . but . . . we can control how we do it! Want to Know Why You’re Still Not Dating?